The first time we met Mike Sutton he took us flying in his Cessna. We took off high above Monterey Bay on the Californian coast of the United States of America, which was once the largest fishery in the Western Hemisphere, accounting for 25 per cent of all the fish landed in the nation back in the 30s and 40s. As I look out of the plane window, I realise that the story of this bay is a story that has been told many times before. (For example, read the previous blog 'Sparring Seals'). We explored California's marine protected area network up in the air in Mike Sutton's Cessna in 2015. In Monterey Bay, it began in the 18th century. The first commercial fisheries were based on marine animals, such as sea otters, fur seals, sea lions and whales. All of these sea creatures have suffered the intense pressure of exploitation; they were targeted for their furs and oils. The Northern Elephant Seal numbers plummeted to about 100 struggling for their species' future. While, in the 1950s, the sardine fishery collapsed. It is easy to look out at the endless blue, the wild creatures playing within it, and yet fail to see the scars of our human impact. A colony of elephant seals near Hearst Castle, California. Their population size has bounced back, since they were officially protected. I was looking out of the window thinking about how the coastal waters of California had endured a rough past of loss and suffering, yet it felt extraordinary to be up in the air, sitting in the back of a plane, knowing that we were flying with a person who has played a big role in trying to mend old wounds. It is October 2015, and we were yet to realise that we would develop a close bond with Mike, and that this was just the first of many adventures with him to come. Mike is a unique character; he is passionate about showing people the world from a bird’s eye view, because he believes that gaining a different ‘physical’ perspective can change our ‘moral’ view entirely. Mike and his ridgeback. Behind Mike is the marine sanctuary and Monterey Bay Aquarium where he worked as Vice President between 2004-12. It’s a different way of looking, not just at the world, but at the make-up of who we are as people from the experiences we gain in our lifetime. It is often said in Australia that our indigenous Traditional Owners saw the world from a bird’s eye view - that is how they were able to navigate and travel across Country. Indeed, in the past, we have been fortunate to speak with elders, who proudly convey their aerial perspective of the world through art and song. Maybe the skills of these elders is a skill that many people once had, but as mainstream society has lost this over time - along with our senses and our connection to the horizon - perhaps we have lost our ability to navigate; to know our true potential as humans. Perhaps, if we start looking out of our world at a different perspective, then just maybe we can get these skills back. Up in the air, everything makes sense. A bird’s eye view truly is the best way to see for yourself how the land is connected to the sea. You can see what lies underneath the water - maybe a reef, or a kelp forest. And, in terms of maps and planning for society’s future, of where you perhaps want to zone to protect a place like a kelp forest to keep it wild, you can see that space very clearly up in the air. Mike’s obsession with gaining an aerial view is creative; it changes everything. High above the Earth, we can see why, over the years, Mike has taken not just us, but many politicians, bureaucrats and journalists in his little one-engine Cessna. He did it so he could convince the decision-makers and public just how special this place is; so he could convince them that it needed to be protected. We would later return to California to film the underwater perspective of the kelp forest. Mike has a deep pride in the way he cares for his Cessna and for his blue ocean home. He knows that the sea here is healing from a history of heavy exploitation. It is a place that he and many others have worked very hard to safeguard. As a child, Mike travelled with his father around South America. His father helped countries to set up national parks. Where did Mike’s unwavering motivation come from? That was the first question I burned to ask in his interview. His desire to change the world was deeply embedded in his family roots. He had travelled the world with his parents in the 60s and 70s, as his father was employed for the US national parks services to help countries set up protected areas on the land. Mike grew up to become a park ranger, studied marine science and law and would eventually take on a number of conservation roles to become Vice President of the Monterrey Aquarium, where he would lead their campaign to ban California’s shark fin trade and kick-start a sustainable seafood movement on the West Coast. According to Oceana, fins from as many as 73 million sharks enter the global shark fin trade each year. 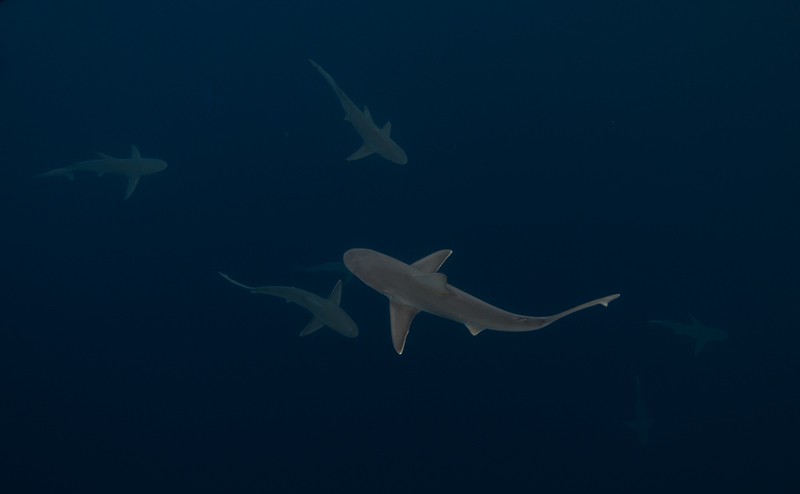 (Before we met with Mike, we took this photograph of a school of sandbar sharks offshore from Oahu in Hawaii, USA). After our first interview with Mike, we knew we had to come back and flesh out his story. He was one of those people who work quietly behind-the-scenes doing some big things. Publicly, he might not get any credit at all, but to him it doesn’t matter. It is all about the bigger picture - securing that big conservation win. Co-Directors James Sherwood and Danielle Ryan ready to take their first flight with Mike Sutton over California's marine protected area in 2015. During that initial visit, we were attending the United Nations Association Film Festival for the screening of two of our shorter marine protected area stories on Australia, so we did not have time to finish filming Mike. This is why we would have to return later on. The second time we met Mike in California, we again tried to squeeze in some time to film him on the way to another event - this time, interviewing Prince Albert II of Monaco at the United Nations - but, unfortunately, we were pressed for time once more. Mike had a great story to tell, but I was worried that perhaps we were never going to get the opportunity to give it the attention that his story deserved. The wild and rugged coastline of California, 2015. On that trip (June 2017), Mike told us that he was about to travel to Palau the following month with a conservation group for work. He suggested we join him. He said we just had to film Palau, as the nation had protected 80 per cent of its waters - something that had never-before been done. The world was watching to see if Palau was capable of enforcing such a huge marine sanctuary. It was a story that we had been following, but had ruled out long ago. Palau was such a remote island and very hard to get to from Sydney, Australia. We knew we just did not have the budget to get to Palau, so I was adamant that we should not go (even though it would be a good story). We just had to draw the line somewhere when it came to filming. California's marine protected area is home to giant kelp forests - the underwater world is well worth exploring next time you visit. Then, out of the blue, something uncanny happened. (‘Uncanny things’ have been happening time and time again on this route to filming the Map to Paradise). While in the United States of America at the United Nations, we had the good fortune of meeting the President of Palau, Tommy Remengesau. This encounter changed the direction of filming entirely. Sometimes, all it takes to change the direction of a story is keeping an open mind and a desire to see the world from a different perspective!